Much as one respects Ross Brawn and his various achievements in motorsport, one cannot help but feel that he is increasingly becoming more and more of a PR man for the sport’s powers-that-be. With Liberty Media still to present a solid proposal for the sport post-2020 in terms of technical and engine regulations, not to mention the restructuring of the prize money, Brawn claims that the success of the regulations – whatever they might be – will be measured by new teams seeking to enter the sport. His comment comes just days after Force India was rescued from administration and at a time Williams and McLaren are making no secret of their need for a greater slice of the prize pot despite their continuing poor form. Then there’s his claim that F1 could be all-electric within the next ten years, a claim promptly knocked back by Formula E founder Alejandro Agag. “Quite frankly, I can’t see a new team coming in today because the revenue distribution and commercial distribution of funds and the technical regulations are too daunting,” he tells the official F1 website’s Fan Voice. “We want to create an environment where there is a queue of professional organisations wanting to own and be a Formula One team. “We have always had this margin of teams at the bottom of Formula One that are hanging on with their finger nails, and often falling, and we want quality competitors, not just people making up the numbers and saying they are in Formula One if they can’t step up. “We want the professional, well-financed, well-structured teams to be entering Formula One in the future and that will be a measure of our success. The delay in the engine regulations, while already causing Ferrari and Mercedes to doubt their futures in the sport, is also causing Renault and Honda to get anxious, the French manufacturer, in particular, arguing that the clock is already ticking. However, with the powers-that-be now likely to go back on the original plan of ditching the MGU-H, as time drags on there are calls for the engine rules to be left as is rather than have manufacturers building power units to two different sets of regulations. 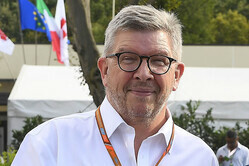 Interestingly, Brawn claims that the teams and manufacturers are finally coming around to the idea that the FIA and Liberty know best and that they will fall in line with the proposals. “I don’t have any major concerns, but we respect the teams,” he said. “They are putting a huge investment and a huge effort into Formula One, so we have to respect them. “We have to respect their opinions and we have to respect their involvement. I think those teams will also say they know Formula One needs some direction from ourselves and the FIA. You see it in their relationships between the teams and you will see there are periods when some teams are aligned and some periods when they are not aligned and that will be to do with the on-track action or other things that are going on. “I know as a team I was not always in the best place to know what is best for Formula One because I was always absorbed in my own objectives and ambitions within the team. Formula One needs the commercial rights holder and the FIA to encourage the teams to come with us and I think they recognise that as well.